The time has come for you to answer the call of the Eyrewood. Thornwatch is currently being sent out to Kickstarter backers and will be available for sale in retail and digital stores on July 31st! Preorders will be accepted starting July 10th on the Lone Shark Games store and Penny Arcade store. Penny Arcade’s Mike “Gabe” Krahulik and Jerry “Tycho” Holkins, Betrayal at House on the Hill and Pathfinder Adventure Card Game developer Mike Selinker, Lone Shark Games lead developer Chad Brown, Lords of Waterdeep co-designer Rodney Thompson, and the whole crew at Penny Arcade and Lone Shark came together to create a graphic novel adventure that bridges the gap between board games and RPGs. Accept the call of the Eyrewood and become one of the Thornwatch, spirits bound to protect the ordinary citizens from the terrors of the forest. As the Blade, Greenheart, Guard, Sage or Warden, it’s up to you to save the day. One player takes up the mantle of the Eyrewood’s ancient Judges and guides the heroes through the adventure. 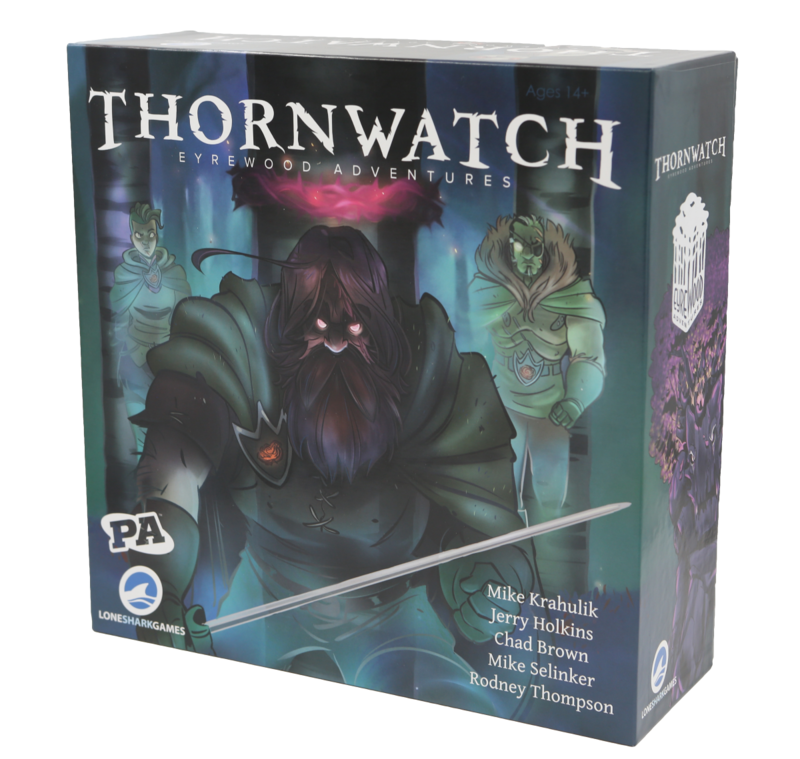 Thornwatch can be pulled off the shelf for 60 minutes of fun, or provide 2+ hours of epic adventure. 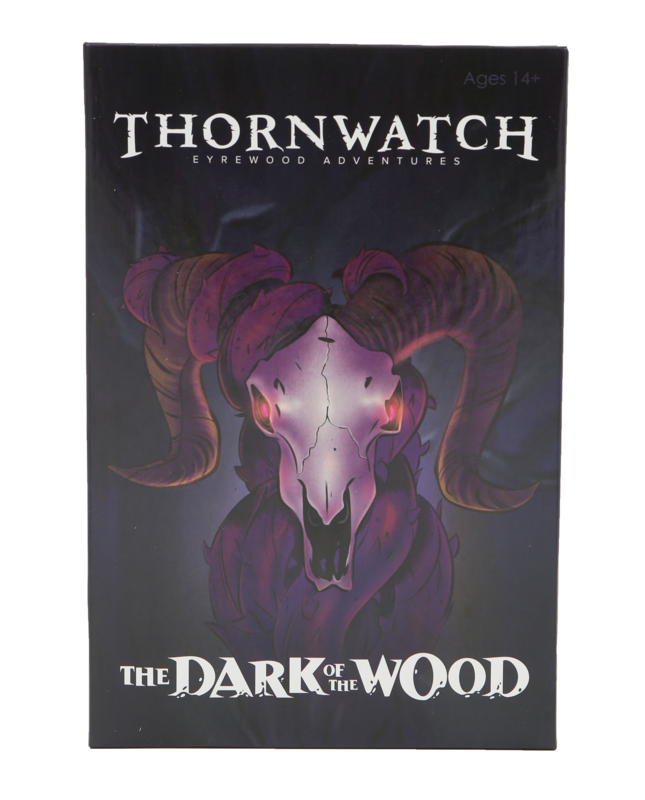 Also available on July 10th is The Dark of the Wood expansion for the Thornwatch Core Set. Summon five new members of the Thornwatch, each bearing the weight of a corrupting curse. This set adds the Briarlock, the Dark Courier, the Unsundered, the Weave-Weald, and the Woldsen, all with new powers and gruesome complications. If you’re looking to add a little more malevolence to the Eyrewood, you’ll want to pick up The Dark of the Wood. With an MSRP of $39.95, The Dark of the Wood contains: 224 cards, 6 trackers, 9 storyboards, 42 pawns, 1 rulebook. For those that backed the Thornwatch Kickstarter, your products are already shipped or will be soon. For those of us who missed out, keep an eye open–we’ll be announcing when you can order from the Penny Arcade and Lone Shark Game stores soon! Stay tuned for more news on Thornwatch, the new Lone Shark Games store, news from Origins and more.